he psaltery is a stringed instrument that enjoyed prominence during the Middle Ages. Its strings, stretched over a soundboard, are plucked with the fingers or a plectrum. In paintings, the psaltery is usually shown resting against the musician's chest or occasionally on the knees. The instrument was played throughout Europe from the eleventh to the early sixteenth century. Its development was influenced by the quànun, or Middle Eastern psaltery, which the Moors introduced into Spain around the twelfth century. The earliest instruments were square, rectangular or trapezoidal. Around the thirteenth century, there appeared a psaltery called the instrumento di porco, so named because of its curved shape resembling a pig's snout. The instrument shown here is a reproduction of this type of psaltery. The three small sides are decorated with a four-leaf motif painted with tempera and gold leaf. A trained musician, Christopher Allworth became interested in historic musical instruments in the late 1960s. After completing a master's programme in medieval religious music at the University of Illinois, he continued his education at Oxford from 1968 to 1971. His study of the religious iconography and music of the Middle Ages drew him naturally to study the instruments of that period. After returning to Canada, Allworth taught music in Yarmouth, Nova Scotia. In 1984, he moved to Halifax, where he teaches only part-time at the Atlantic School of Theology in order to devote more time to the craft of luthier. He also works as organist and music director at St. John's Anglican church. 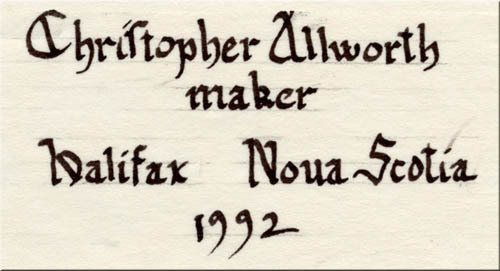 The first instruments that Christopher Allworth crafted were reproductions of instruments used before 1450. 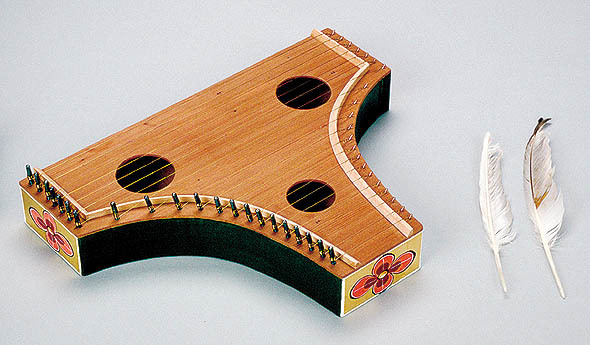 They include the psaltery, vithele, medieval viol, symphonia (medieval hurdy-gurdy), harp, and lyra (or gigue). In the last few years, he has worked exclusively on bow instruments: the viol, the vithele and the lyra. His wife, Carolyn, paints the decorative motifs in tempera and applies gold leaf, in keeping with the style appropriate to each instrument.